No Sign of any unusual activity at the Nayland Rock just before noon today. In fact, with the heavy rain, that postponed my flight for Kent Police, there was hardly a soul to be seen. Ed: Here's the BBC report on what appears to have been a real tragedy involving one of the guests at the hotel. "A man has died after apparently falling out of a window at a hotel at a seaside resort in Kent. 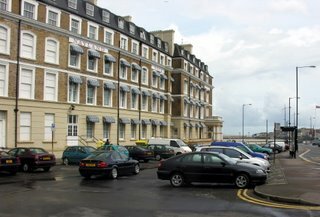 Police were called to the incident, at Nayland Rock Hotel in Royal Crescent, Margate at 0730 on Saturday. The man, who was in his late 50s and not believed to be from the local area, was pronounced dead at the scene by South East Coast Ambulance paramedics." Police said officers were investigating the man's death but it was not thought to be suspicious."